The bonds of Jewish peoplehood have stood at the heart of Jewish group definition since the days of Abraham and Sarah. Judaism is more than a religion; it demands identification with the Jewish people as a whole, a familial closeness with Jews of all kinds everywhere. Jews, whether by birth or by choice, must consider themselves links in a great chain of Jewish tradition, a shalshelet (chain) that stretches across the generation binding Jews across time and into the future. I can walk into my temple and feel that others do not see me as outsider. I can walk into my temple and feel that others do not see me as exotic. I can walk into my temple and feel that my children are seen as Jewish. I can walk into my temple with my family and not worry that they will be treated unkindly because of the color of their skin. I can enjoy music at my temple that reflects the tunes, prayers, and cultural roots of my specific Jewish heritage. No one at my synagogue will attempt to assign me to a ethnicity to which I do not belong (e.g., assuming all Jews of African descent are Igbo or Ethiopian). I can easily find greeting cards and books with images of Jews who look like me. I can easily find Jewish books and toys for my children with images of Jews that look like them. I am not singled out to speak about and as a representative of an “exotic” Jewish subgroup. When I go to Jewish bookstores or restaurants, I am not seen as an outsider. I find my experiences and images like mine in Jewish newspapers and magazines. I do not worry about access to housing or apartments in predominately Jewish neighborhoods. My rabbi never questions that I am Jewish. When I tell other members of my synagogue that I feel marginalized, they are immediately and appropriately responsive. There are other children at the religious school who look like my child. My child’s authenticity as a Jew is never questioned by adults or children based on his/her skin color. People never look at me and say “But you don’t look Jewish” either seriously or as though it was funny. I do not worry about being seen or treated as a member of the janitorial or administrative staff at a synagogue or when attending a Jewish event. I am never asked “how” I am Jewish at Jewish dating events or on Jewish dating websites. I can arrange to be in the company of Jews of my heritage most of the time. When attempting to join a synagogue or Jewish organization, I am sure that my ethnic background will not be held against me. I can ask synagogues and Jewish organizations to include images and cultural traditions from my background without being seen as a nuisance. I can enroll in a Jewish day school, Yeshiva, and/or historically Jewish college and find Jewish students and professors with my racial or ethnic background. People of color do not question why I am Jewish. I know my racial or ethnic background will not be held against me if I attempt to join a minyan in prayer. I know my ethnic background will not be held against me in being called to read the Torah. I am not discriminated against in the aliyah process as a Jew because of my particular ethnicity. 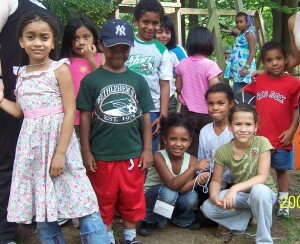 The list is an educational resource developed from 2006-2009 by Corrine Lightweaver, Sasha King and members of the Jewish Multiracial Network for rabbis, Jewish educators, philanthropists, activists, and lay people. Ahhh, feel the love. 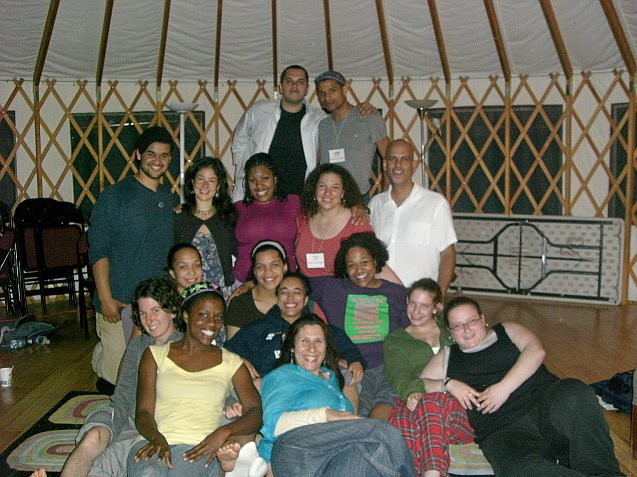 The crew at the Jewish Multiracial Network Retreat. 1 ~ Reach out to other Jews across difference because you will find our commonalities exceed our differences by far. 2 ~ Do not assume that Jewish history and the current Jewish population is comprised most significantly of Jews of European culture ancestry. 3 ~ Consider that within the customs and traditions of the Jewish people, there is a great diversity of language, culture, custom and color. Be willing to reach for and stay connected to the diversity of the Jewish people. 4 ~ Do not assume that because a person has dark skin that they must be a convert. This is not necessarily true or fair to individuals that have been Jewish all of their lives. 5 ~ Learn to value the “inner” Jew in yourself so that you can better appreciate it in others. 6 ~ Get to know the customs and traditions of Jews from the Middle East and North Africa and welcome this knowledge as a necessary component of your Jewish education. 7 ~ If you find a person’s journey around difference to be inspiring, be it their color, background, abilities, culture, traditions, etc., try not to limit your praise of them to their being “inspiring”.Tell them what about them inspires you specifically. 8 ~ Remember that it’s o.k. to be curious, but to become fascinated with a person because of an aspect of their physicality ALONE, is to turn that person into an object in your regard. Make efforts to make your relationships with people who are different than you, more than skin deep. 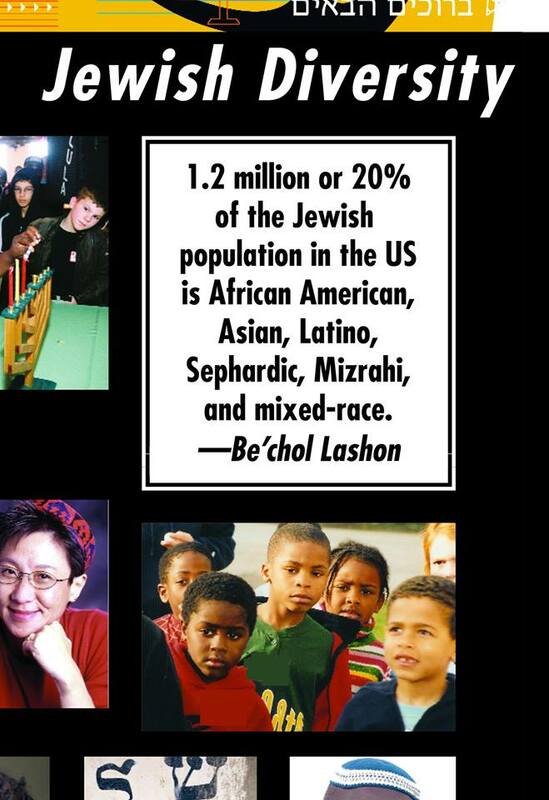 9 ~ Keep in mind that Jews of Color have a lot to offer the Jewish community, both in experience and perspective and should be welcomed to participate in all levels of Jewish social interaction, including leadership.